Voivod still bring forth a spacey science fiction feel to their latest release. Their sound is very mechanical and it’s as adventurous as ever on this disc. The tracks are fairly long and go through a number of twists and turns. It is progressive, but is held back at times by fairly standard song structures. The riffs are razor sharp and make for an exciting listen, but I fear the band wanders into too weird territories at times. This is a small flaw and their futuristic sound still has a lot of appeal in today’s musical landscape. How does this compare to the classics like Nothingface and Angel Rat? The band are able to bring aspects of those albums into play with a decidedly new approach. I don’t think this eclipses those albums as they had something more original in them at the time. That’s not to say this album doesn’t try anything different because it often does. It’s successful in bringing together influences from other albums including the last one Target Earth into a melting pot and creating a fresh new set of songs. This band is very different than a lot of others and this is part of what makes them so appealing. I don’t see this music as game changing as a few have, but it’s definitely an enjoyable listen. The band is appealing because of their weirdness, but I also feel this holds them back from being even better. Make no mistake that this is more quality material from the band and highly worth checking out. It brings the space laden style into great effect and crafts some intriguing songs in the process. Though I don’t believe this topples their classic discs, it is still a highly desirable album. 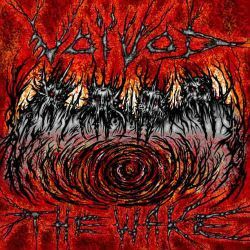 Fans of the band should have no problem liking The Wake as it resonates with quality Voivod content.